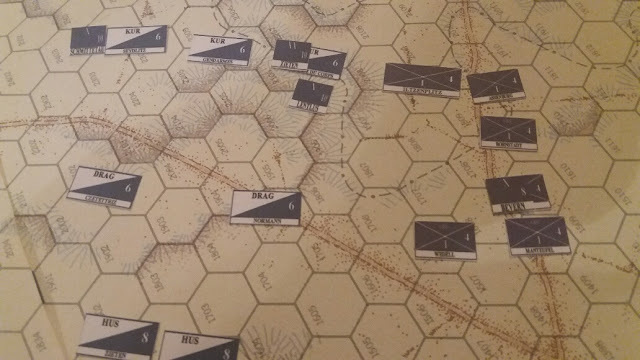 I finally increased and completed the counters for the Prussian Army, and therefore I tried to array them on the map of the gameboard LEUTHEN of Clash of Arms publishers. Top: here it's possible to see the details of my counters: they are quite simple, The names of the units are on the bottom and cavalry units has on the top the description (KUR = Curassiers, DRAG = Dragoons; HUS = Hussars); but what I would like to point out is that also the dimensions of the counters vary as in reality. In fact the caalry units are narrower than the infantry units and the Grenadiers units are much narrower than the normal infantry units. This recreates the reality of the dimensions of the units on the battlefield. 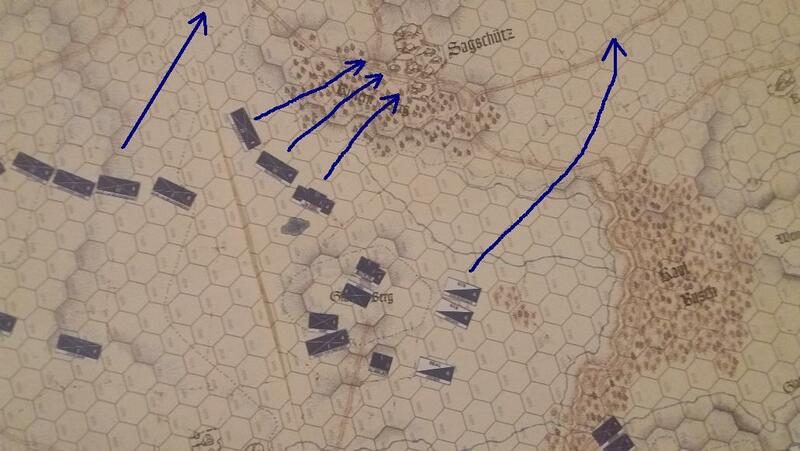 Bottom: The Prussian units moved towards the village of Sagschutz like they actually did. And here comes the surprise! 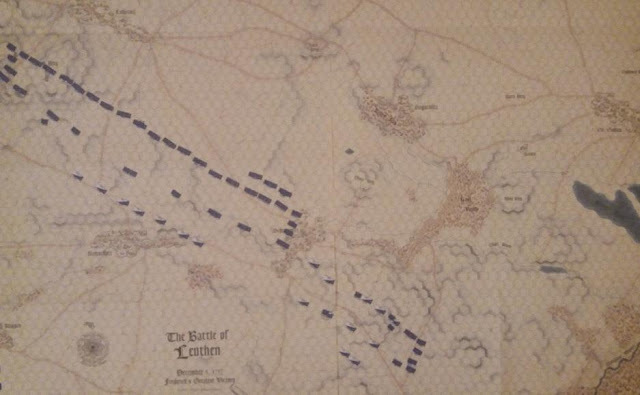 Through a correct dimension of the counters and a magnificent map it's possible to understand how allegedly the battle went on, even where there are no historical reports. 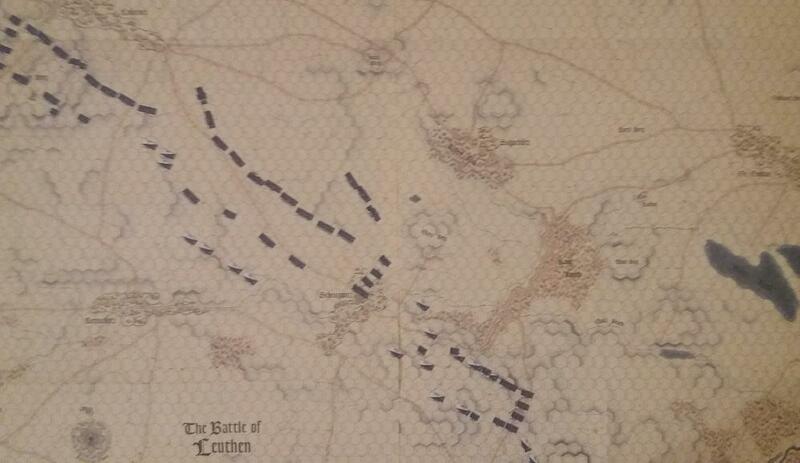 Actually, I draw here the supposedly lines of attack of the Prussians. It is evident that the 3 battalions of the avantgarde attacked the village but for the rest of the Army there was not space and they had to go further. Bottom: The detail of the attack on Sagschutz as it occurred and the supposed other lines of attack; it is actually likely that part of the cavalry on the far right went through as here shown, menacing to cut off the line of escape of the Wurtembures and Bavarians (here not represented) defending the village. This would also explain why this troops broke immediatly and fled. Probably they saw part of the cavalry trying to cut them off. Bottom: I represented 6 lines of attack that probably occurred in the real battle. Starting from left: this line of attack is too on the left and its units actually will not partecipate too much to the following attack on the village of Leuthen. The second line is the line that is going to smash on the village of Leuthen disregarding the attack on the village of Sagschutz (3rd line of attack); the fourth line of attack is represented by a mixture on infantry and cavalry that is pushing forward to cut off the escape of the defenders of the village. The 5th line is quite complicated: I found myself with the woods in front of the units and so the best way to proceed is through the street that runs along the woodland. The 6th line is represented by the 10 squadrons of the Zieten's Hussars that are pushing forward, bypassing the woodlands, counting on their speedness. (regarding this point I increased the value of movement of the Hussars in comparation to that of Clash of Arms, where the Hussars can move at the same rate of Curassiers units (6). For me Hussars have a 8 as factor of movement.